Caithness Creels produce various types of creel. These have all evolved from discussions with fishermen over many years and were then tried and tested in the waters of the Pentland Firth. The frames are made of 8, 10 or 12mm diameter steel or a combination thereof. All are double welded where necessary (there is no spot welding) then coated in plastic. Creels are covered using 3mm braid net of 60 or 70 mesh size with nylon eyes. Our most popular is a traditional Scottish creel with soft nylon eyes. 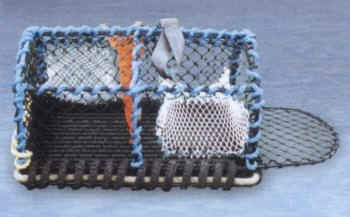 These are multi purpose for catching crab, lobster, velvet and green crab. Bait bags con be added to preserve bait and fish longer. Sizes from 23"x16"x14" to 30"x20"x16".